Nearly everyone will experience some form of back pain in his or her lifetime. The low back is the area behind the belly from the rib cage to the pelvis and is also called the lumbar region. 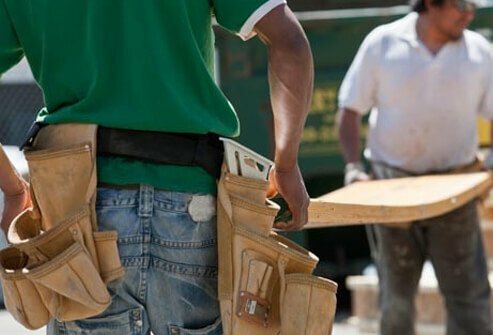 Back pain is a major cause of missed work. Low back pain usually resolves on its own and is commonly the result of a strain injury. There are many treatments for low back pain. At Risk for Lower Back Pain? Low back pain can start in a person’s early twenties and continue on throughout adulthood. Studies have shown that up to 80% of the general population are affected by low back pain (LBP) at some time during their lives. Learn to prevent lower back pain by knowing what activities could be putting you at risk. 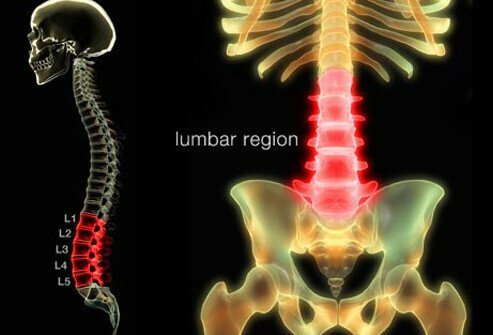 Low Back Pain Symptoms: Does Your Back Hurt? Low back pain symptoms range from sharp and stabbing to a dull ache. The pains can be constant or intermittent and positional. Acute low back pain can appear suddenly after injury. Chronic back pain is defined as pain lasting more than three months. Consult a doctor if you have prolonged back pain longer than 72 hours. Severe back pain after an injury should be evaluated by a health-care professional. 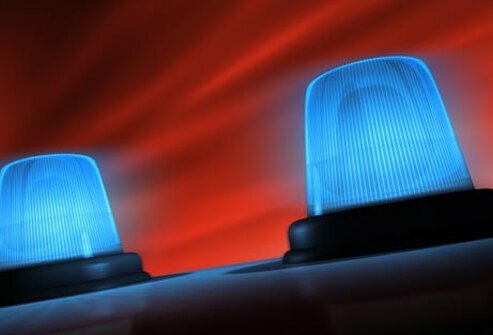 Warning signs of more serious injury include pain with coughing or urinating, loss of control of the bowels or bladder, new leg weakness, and fever. These additional symptoms require medical evaluation. Is It Muscle Strain or Sciatica? Back pain that occurs after excessive exercise or heavy lifting is frequently a strain injury. However, occasionally these activities cause disc injury and rupture or herniation. 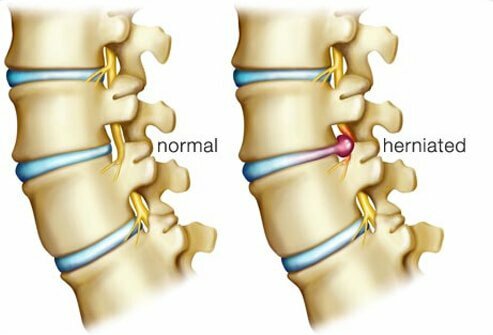 When a herniated disc irritates the sciatic nerve, it can cause back pain. Sciatica is a form of nerve pain caused by pressure on the sciatic nerve. The sciatic nerve is a large nerve that runs down through the buttocks and extends down the back of the leg. 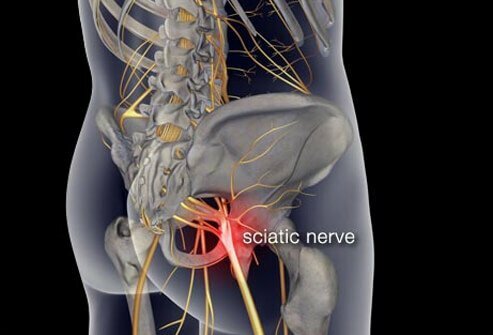 Pressing on or pinching of the sciatic nerve causes shock-like or burning low back pain. Sometimes people feel as if the pain radiates down through the buttocks and down one leg, sometimes even reaching the foot. 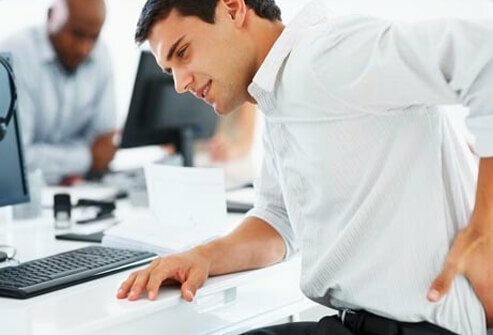 Is Your Job Causing Back Pain? A job that involves pulling, lifting, or twisting with the low back can cause injury and low back pain. Even prolonged sitting in an awkward position can cause low back pain. Standing on your feet for hours on end? That can cause lower back pain too. The best way to prevent back pain is to know if you are at risk. 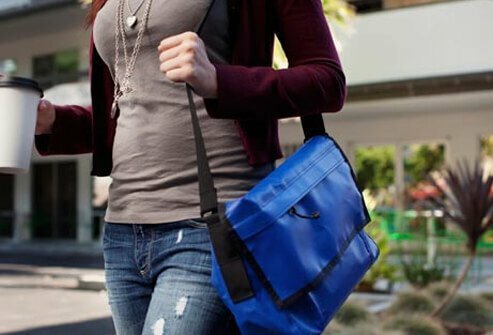 Carrying an overstuffed purse, briefcase, or handbag can strain the low back. If you must carry a heavy load, consider using a wheeled briefcase instead. By reducing the amount of weight you’re carrying, you reduce the amount of pressure on the spine. Help keep your kids’ backs healthy by making sure their backpacks are not overloaded. A heavy backpack could mean future back pain for your little ones. Most athletic injuries to the back are sprains of the ligaments or strains of the muscles surrounding the spine. Serious conditions or complications can have similar symptoms to those of a routine sprain or strain. The most common sports injuries occur after repetitive overuse of the spine either through twisting, compression, or flexion. High impact sports such as running, football, or volleyball can often cause low back pain. 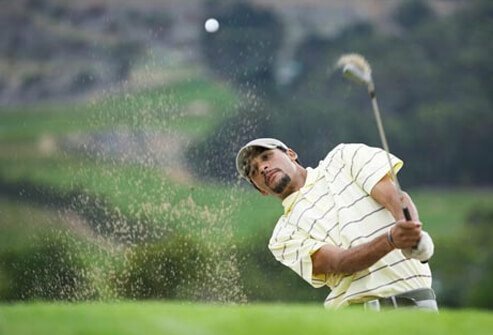 Sports like golf, in which repetitive twisting is often involved, can also cause low back pain. The back provides optimal support when we stand properly and do not slouch. Sitting with proper support for the low back with shoulders back and even a foot rest can prevent low back pain. Proper balance on the feet when standing can also minimize the risk of developing low back pain while up. The vertebrae, or bony building blocks of the spine, are cushioned by gel-like discs in between the vertebrae. These discs can degenerate with aging and are prone to injury as a result. When a disc ruptures, it is referred to as a herniated disc, which can cause significant pain. Conditions that can lead to chronic low back pain include spinal stenosis, spondylitis, and fibromyalgia. 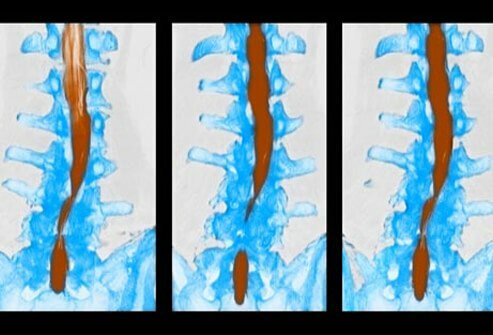 Spinal stenosis is narrowing of the normal spinal canal through which the spinal cord passes. Spondylitis is chronic inflammation of the spine. Fibromyalgia is a muscle disorder that features chronic muscle pain and tenderness. Are You Making Your Back Pain Worse? Wear comfortable, low-heeled shoes if you are on your feet all day. Don’t slouch when standing or sitting. Warm-up and stretch before exercise or other strenuous physical activity. 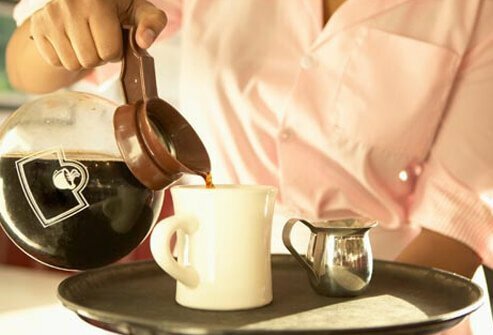 Don’t try to lift objects that are too heavy and don’t twist while lifting. Live a healthy lifestyle, stop smoking, and keep off the extra weight. Your description of your back pain is very important for your doctor to diagnose your condition properly. It can be helpful to note when and where the back pain began, what activities you do, related symptoms, and any chronic medical conditions. 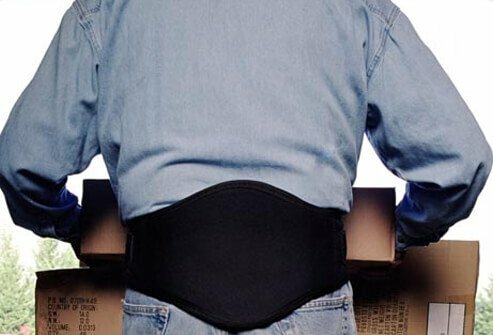 Hot or Cold Therapy for Low Back Pain? Hot or cold packs may help ease pain and reduce symptoms. The soothing relief from heat, or the dulling relief from a cold pack, is only temporary and will not treat more serious causes of back pain. However, they may provide greater mobility for people with acute, subacute, or chronic pain allowing people to get up and get moving. Will Bed Rest Help Back Pain? Doctors often recommend continuing your usual activities of daily living as soon as possible. Studies suggest that strict bedrest can often prolong or worsen low back pain. Bed rest can also lead to secondary complications such as depression, decreased muscle tone, and blood clots in the legs. You should try and keep moving while avoiding activities that noticeably aggravate or worsen back pain. By staying active, those who suffer from low back pain can gain greater flexibility and quicker recovery. If back pain doesn't go away in three months, there's evidence that yoga can help. In one recent study, people who took 12 weeks of yoga classes had fewer symptoms of low back pain than people who were given a book about care for back pain. The benefits lasted several months after the classes were finished. The study suggests conventional stretching also works just as well. Make sure your instructor is experienced at teaching people with back pain and will modify postures for you as needed. Should I See a Chiropractor for My Back Pain? Spinal manipulation is used by chiropractors and osteopathic physicians to treat low back pain in selected patients. Spinal manipulation applies hand pressure to areas of the low back to relax irritated muscle and lessen the intensity of the pain. Traction, using pulleys and weights to lengthen and stretch the spine can result in temporary relief. 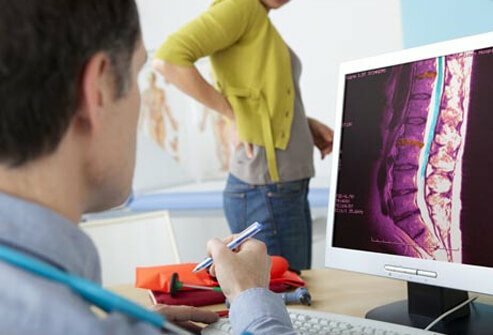 Both techniques will not treat any underlying causes of back pain, but rather offer a temporary relief from lower back pain. Studies have shown that massage treatments can help relieve chronic low back pain. Massage treatment can restore people to their usual activities of daily living and lessen pain. Massage therapy is limited, and would not be the most effective solution for patients with spinal complications, injuries, or disk problems since massage focuses on the release of muscle tension and not on the structure of the spine itself. Acupuncture can be moderately effective for chronic low back pain. With acupuncture, fine needles are inserted into various points around the body. 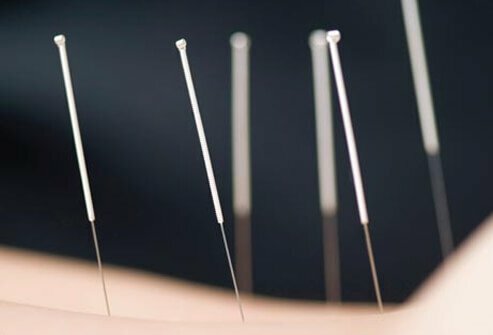 Acupuncture practitioners hypothesize that when these thin needles are inserted into the skin and then stimulated by twisting or tapping, naturally occurring chemicals such as endorphins, serotonin, and acetylcholine are released to relieve pain. Anecdotal evidence suggests acupuncture can be an effective pain reliever. Further scientific and clinical studies are underway to prove the efficacy of acupuncture therapy. A wide range of medications is used to treat both acute and chronic low back pain. Analgesic medications are specially formulated to relieve pain. 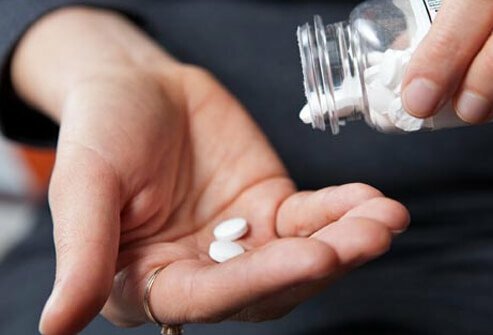 They include over-the-counter acetaminophen and aspirin, as well as prescription opioids such as codeine, oxycodone, hydrocodone, and morphine. Nonsteroidal anti-inflammatory drugs (NSAIDS) can also be used to relieve pain and inflammation. Over-the-counter NSAIDS include ibuprofen, ketoprofen, and naproxen sodium. Several others, including a type of NSAID called COX-2 inhibitors, are available only by prescription. There are also many topical creams or sprays that can dull and soothe low back pain. These are applied to the skin and thus stimulate localized nerves to provide feelings of warmth or cold in order to dull the sensation of pain. Topical analgesics can reduce inflammation and increase blood flow. 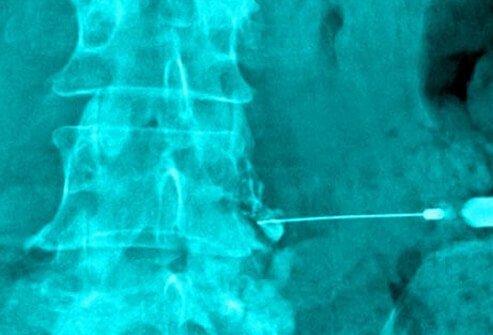 Epidural steroid injections are a commonly used short-term choice for treating low back pain and sciatica. These injections work by reducing inflammation to relieve pain. Injections are intended for short-term use and should not be utilized for an extended period of time as they may worsen pain in the long run. For those with chronic pain or sever spinal injury, a nerve block may be utilized to prevent nerve conduction in a certain area. This essentially blocks all feeling from nerves. Nerve blocks are typically only used in extreme cases of severe pain. Is it Time for Back Surgery? 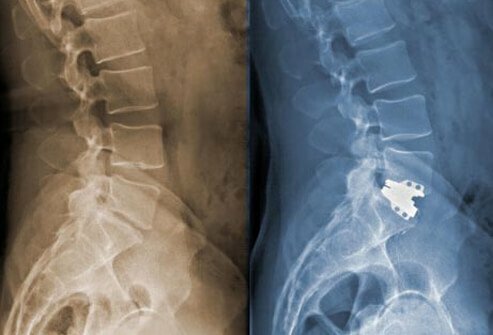 Back surgery is often a last resort when all other treatment options have been tried. Surgery may be considered an option to relieve pain caused by serious musculoskeletal injuries or nerve compression resulting from vertebrae shifting or collapsing. Back surgeries often have a long recovery period, and some patients may lose mobility and flexibility post-surgery. It is also important to note that not all surgical procedures are successful. As such, it is important for patients to talk with their physicians and know all of the risks associated with a procedure before undergoing back surgery. Rehabilitation programs can not only help in the healing but also decrease the risk of reinjuring the low back. Guided physical therapy with stretching, strengthening, and low-impact exercises is used to optimize short- and long-term outcomes. Flexion and extension exercises are commonly used to prevent low back pain. Be sure to review with the doctor any program you are considering. Ankle Pumps: Lie on your back and move ankles up and down. Heel Slides: Lie on your back and bend then straighten the knees one at a time. Wall Squats: With your back flat against a wall, sit like you would in a chair with your knees lined up over your ankles. Gently press against the wall, keeping your abdominal muscles tight. Hold for five seconds. Single Knee to Chest Stretch: Lying down with back flat, pull your knee into the chest. Steps to lower your risk of back pain as you age include exercising regularly (and not irregularly), maintaining a healthy weight, lifting with the legs and not the low back, and optimizing your workstation. After any period of prolonged inactivity, a regimen of low-impact exercises is recommended. Speed walking, swimming, or stationary bike riding 30 minutes daily can increase muscle strength and flexibility and protect your low back from injury or strain. Frequent stretching can help loosen muscle tension, strengthen your core muscles, and improve over-all posture for a healthier back. JH Klippel, et al., The Primer On The Rheumatic Diseases, Springer, 2008. CDC: "Improving Work Safety: Small Underground Mines"
National Institute of Neurological Disorders and Stroke: "Back Pain"
SpineUniverse.com: "Jobs That Put Your Back at Risk"
American Academy of Orthopedic Surgeons: "Low Back Pain Exercise Guide"